Officer Kenneth Braden is a full-time instructor at the Police Academy. He has been employed with the Overland Park Police Department for over 25 years. Officer Braden is a graduate of Missouri State University with a Bachelor of Science degree in communications. He was four-year letterman with Missouri State's football team, the Bears. Officer Braden was hired in 1990 at Overland Park Police Department. He has worked in Patrol, Drug and Community Policing units. In January 2016 he was assigned to the JCRPA and now teaches Fair and Impartial Policing, Theft, Auto Burglary, Burglary, Missing Persons and Suspect Identifications. Staff Instructor — Physical Training, Defensive Tactics, Firearms, OC, Report Writing, Officer Survival and Stress Management. Cpl. Garry Redding has a BA in Anthropology from the University of Kansas. He began his law enforcement career in 1993 with the Johnson County Park Police. He was then hired by the Lenexa Police Department in 1997. During his time at Lenexa, Cpl. Redding has served in patrol and directed the patrol unit, training unit, school resource unit and court security. He has also been an operator and sniper for the tactical team. In addition, he is an instructor for the department in firearms, less-lethal, active shooter, low-light, defensive tactics, ASP baton, lateral vascular neck restraint, OC, chemical munitions, field force and Simunitions. Cpl. Redding was assigned to the Police Academy in 2019. He instructs courses in physical training, defensive tactics, firearms, report writing, officer survival and stress management. Ken Sissom began his career as a police officer with the Paola Police Department in 1976. After two years he was hired as deputy at the Johnson County Sheriff’s Department. A year later he accepted appointment as police officer for the Merriam Police Department, where he worked for 26 years until he retired in late 2005. From 1992 until his retirement in 2005, Sissom served as Merriam Police Department’s Chief of Police. In that time he held the office of past president of the Johnson County Police Chiefs and Sheriffs Association, the Kansas City Metropolitan Police Chiefs and Sheriffs Association and the Kansas Association of Chiefs of Police. In 2008, he was hired by Johnson County Community College as a professor for the Administration of Justice department, where he taught until 2013. In December 2013, Ken Sissom was appointed as the Director of the Johnson County Regional Police Academy. Sissom has an AA degree from JCCC, a bachelor’s degree in criminal justice administration from Park University and a master’s degree in criminal justice from Washburn University, Topeka. Officer Kurt Skiles began his career with the Olathe Police department in 1988. 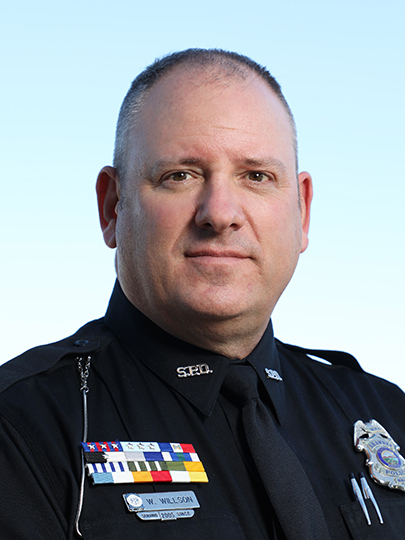 During his career he has served as a Patrol officer, detective, field training officer, department training coordinator and tactical support unit operator. He is an instructor in firearms, less-lethal munitions, Taser, FX simunitions, handcuffing, OC, EVOC, active shooter and officer survival in low-light conditions. Officer Skiles has been involved with the Police Academy since 2006. Officer Skiles instructs report writing, less lethal, active shooter and assists with scenario based training, EVOC and firearms. Officer Wade Willson began his career with the Shawnee Police Department in 2005. While at Shawnee, Officer Willson has been a field training officer, Taser instructor, active shooter instructor, and handgun, rifle and sniper instructor. He is currently the training officer of the tactical team, of which he has been a member for 10 years. Officer Willson was assigned as a full-time staff instructor in 2018. He instructs alcohol beverage control law, traffic stops and patrol procedures, and is responsible for the scenario-based training. He also assists with active shooter, range and Taser training.